Bandana-print mule slide with curved topline Fabric upper Almond toe Slip-on style Leather lining Leather/rubber sole Imported. Women's Shoes - Contemporary Womens Shoe. Ancient Greek Sandals. Color: Marine. Size: 36 (6). 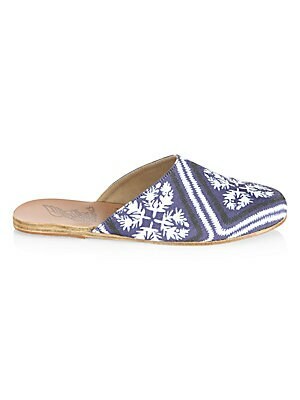 Classic slides with crisscross detail on vamp Leather upper Open toe Slip-on style Leather lining and sole Imported. Women's Shoes - Contemporary Womens Shoe. Ancient Greek Sandals. Color: Marine. Size: 35 (5). Classic slides with crisscross detail on vamp Leather upper Open toe Slip-on style Leather lining and sole Imported. Women's Shoes - Contemporary Womens Shoe. Ancient Greek Sandals. Color: Marine. Size: 36 (6). Classic slides with crisscross detail on vamp Leather upper Open toe Slip-on style Leather lining and sole Imported. Women's Shoes - Contemporary Womens Shoe. Ancient Greek Sandals. Color: Marine. Size: 37 (7). Classic slides with crisscross detail on vamp Leather upper Open toe Slip-on style Leather lining and sole Imported. Women's Shoes - Contemporary Womens Shoe. Ancient Greek Sandals. Color: Marine. Size: 38 (8). Classic slides with crisscross detail on vamp Leather upper Open toe Slip-on style Leather lining and sole Imported. Women's Shoes - Contemporary Womens Shoe. Ancient Greek Sandals. Color: Marine. Size: 39 (9). Classic slides with crisscross detail on vamp Leather upper Open toe Slip-on style Leather lining and sole Imported. Women's Shoes - Contemporary Womens Shoe. Ancient Greek Sandals. Color: Marine. Size: 41 (11). Comfy leather sandals featuring a creative bow tie accent Fabric upper Slide-on style Leather lining Leather /rubber sole Imported. Women's Shoes - Contemporary Womens Shoe. Ancient Greek Sandals. Color: Light Denim. Size: 35 (5). 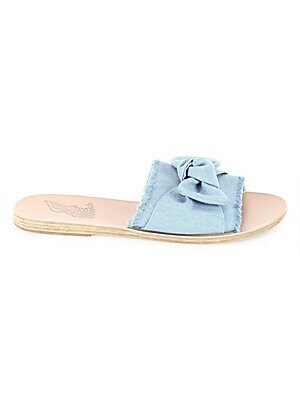 Comfy leather sandals featuring a creative bow tie accent Fabric upper Slide-on style Leather lining Leather /rubber sole Imported. Women's Shoes - Contemporary Womens Shoe. Ancient Greek Sandals. Color: Light Denim. Size: 36 (6). Comfy leather sandals featuring a creative bow tie accent Fabric upper Slide-on style Leather lining Leather /rubber sole Imported. Women's Shoes - Contemporary Womens Shoe. Ancient Greek Sandals. Color: Light Denim. Size: 37 (7).